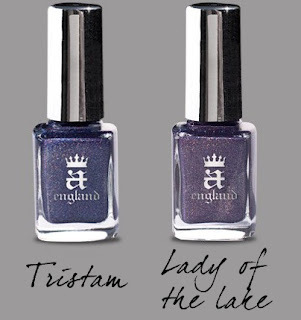 A few days ago, I received an enigmatic email announcing the launch of a new nail polish brand : a-england. (I believe it doesn't take capital letters). I must say that it really caught my interest, first because I had never heard of it before and second because it was such an attractive concept : from the design of the bottle, to the name of the shades, to the entire spirit of the collection : a total immersion into the medieval english literature. a-england offers a 12 colors, salon quality, core collection : "The Mythicals", along with 2 holographic shades : "Gem of the Month" and both a base and a top coat : The Knight and The Shield. apart from being B3F (no DBP, Formaldehyde or Toluene), the nail polishes are not animal tested and I think that Adina has a very strong position on the matter, being a proud vegetarian for 24 years now. If you'd like to have more info, you can visit their website here, they do offer international shipping. I adore the concept! Really awesome. From the bottles I'd love to have Tristam, Lady of the lake (loooooooooooove the name!! ), Galahad, Perceval, Avalon, Elaine and Morgan Le Fay for the name, since I love her character. BTW, I tagged you for a Stylish Blog Award. I won't spam with links, I can send it over email.